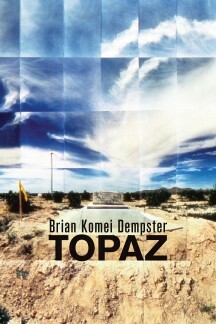 Topaz by Brian Komei Dempster is the winner of the 2014 15 Bytes Book Award in Poetry. on broken glass. What could I do? A great aunt. fault. Where was I? Who told your father? Did he tell you? we are huddled close, smoldering. "But my favorite poems are the eight that are quite sparse, poems like 'Topaz,' 'Sheer,' and 'Pearl.' These minimalistic poems linger, like those fragments of memory that all of us try so desperately to hold on to as time passes and events are drawn further back into the past. These are the poems that Dempster uses to pull the narrative of his own family together. And these are the poems that hold the collection together in a place that is solid and grounded, grounded in family and history, suffering and love." Read the full review. "This is a book of astounding richness, one which deserves multiple re-readings. Like the gemstone of its title, it reveals new beauty with every new examination." Read the full review. “Topaz moves gracefully, almost seamlessly, between ruminations of his maternal family’s experiences in detention and his own questions about who he is and what implications his family’s history may have on his own.” Read the full review. "Intimacy in the face of terror is one of the great gifts of language. Nothing is more intimate than home, the place where love lives, strains, and endures. Family and memory are durable, sustaining, despite the long hatchet of history. We know this, but poetry has a special way of reminding how important and necessary communication is. Language and memory are the twin roots connecting us to both people and place, and Dempster's collection is a sobering reminder of how fragile and powerful those roots are." Read the full review. "Against this history, Dempster tells stories of his family: his grandfather painting and performing rites, his grandmother writing between kitchen chores, an uncle who died in the Korean War and another who died of cancer. He watches his father brush his mother’s hair. He watches himself clasp a jade necklace on his wife’s neck. In recounting these devotions through the fractures of history, he finds an identity shaped by traumas he did not directly experience and asks what it means to love." Read the full review.